At the latest Casey Research conference, Recovery Reality Check, James Rickards, senior managing director of Tanget Capital Partners and author of Currency Wars: The Making of the Next Global Crisis, debates Harry Dent, founder and president of HS Dent Foundation, on the subject of which is more likely in the near-term economic future, inflation or deflation. A new round of severe sanctions is set to go into place on Nov. 4, 2018. These new sanctions will result in a near complete shutdown of Iranian oil sales and an end of direct investment in Iran. Trump is on the path to regime change in Iran unless a new agreement is reached that is much stronger from the U.S. perspective than the JCPOA. Iran’s oil sales to South Korea, Italy, Japan, the UAE, Spain, France and Greece are likely to be shut down or greatly curtailed by the new Trump sanctions. That leaves China, India and Turkey as Iran’s only large customers. Turkey and India are facing financial crises of their own and may not have the hard currency to pay Iran. That leaves China as Iran’s only source of hard currency going forward. China will not stop buying Iranian oil; they need the oil desperately. Iran will not stop selling oil to China; they need the hard currency desperately. Still, Trump’s sanctions will force China and Iran into financial and logistical gymnastics to avoid interdiction by Trump. Iran will use its own tanker fleet to ship the oil because third-party countries won’t allow their tankers to violate the sanctions. China will have to cheat on SWIFT message traffic notices to avoid appearing to credit Iran with hard currency. Even with these workaround methods in place, the two-way flow of oil and currency will become more difficult. The impact on China and Iran will be to slow both economies even if the oil and currency keep flowing. China is between a rock and a hard place because it’s trying to control the increase in debt while trying to borrow more and pay its debts at the same time. Iran is in even worse condition because its foreign investment currency lifelines are being cut one by one even as the government struggles with hyperinflation, bank runs and social unrest. Both of these situations could be alleviated if China would give Trump the trade deal he wants and if Iran would give Trump the nuclear deal he wants. Both outcomes are unlikely in the near term because of the confrontational geopolitics standing in the way. Markets have been notably docile lately despite crises in Argentina, Turkey, Indonesia, Iran, China, Venezuela and elsewhere. Political crises related to Brexit and U.S. political dysfunction have not roiled global markets so far. The calm and low volatility are about to end. The China-Iran nexus in confrontation with the U.S. is the last straw. Let’s begin with the China debt bomb. As is apparent from the chart below, China has the largest volume of dollar-denominated debt coming due in the next 15 months. 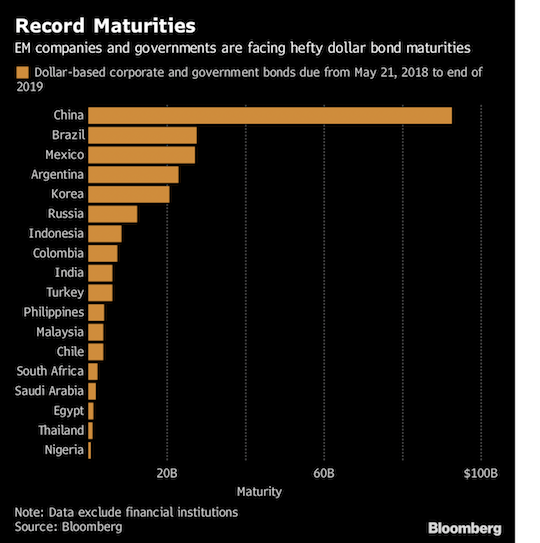 The chart shows China with almost $100 billion of external dollar-denominated liabilities maturing before the end of 2019. But this debt wall is just the tip of the iceberg. This chart does not include amounts owed by financial institutions nor does it include intercompany payables and receivables. China’s total dollar debt burden is over $200 billion and towers over other emerging-market economy debt burdens. But this monetary tightening also hurts growth. Selective defaults have already emerged among some large Chinese companies and certain regional governments. The overall effect is tighter monetary conditions, reduced access to foreign markets and slower growth all coming at the worst possible time. The situation in Iran is even more fraught. The U.S. waged a financial war on Iran from 2011–13. The first step was to impose sanctions on Iranian individuals and entities. Then Iran was banned from using the U.S.-controlled Fedwire system to send or receive U.S. dollars. This move effectively cut Iran off from receiving hard currency for its oil. Iranians smuggled dollars into Iran from Iraq and ran a black market to get dollars to pay Dubai-based smugglers to bring in consumer goods. There was a run on the Iranian banks, interest rates were moved to 20% to stop the run and the Iranian rial collapsed. Inflation soared and anti-government demonstrations emerged. Iran was halfway to regime change without a shot being fired. Obama declared a truce in the financial war at the end of 2013 in exchange for negotiations on the Iranian nuclear program. This resulted in the 2015 Joint Comprehensive Plan of Action, JCPOA, a multilateral agreement on Iran’s pledge to stop uranium enrichment. Obama paid billions of dollars in cash and gold to Iran as a bribe to secure this agreement. After the agreement, Obama ended many economic sanctions on Iran. Direct foreign investment, mostly from Europe, started up again. Last May, Trump tore up the JCPOA and resumed sanctions under a doctrine of “maximum pressure.” The difference now is that Iran wasted the Obama bribe money on foreign adventures and terrorism in Iraq, Yemen, Syria, Lebanon, Gaza and Sinai. The situation in Iran today is even worse that it was in 2013. At the height of the Chinese capital outflows in 2016, China was losing $80 billion per month of hard currency to defend the yuan. "The greater threat to financial markets will come, in my opinion from the slowing of global growth, at least partially due to the current state of international trade. This thought process is lent some credence by last night’s rather disastrous across-the-board macroeconomic numbers released by China’s National Bureau of Statistics. … For the Month of July, in China – Fixed Asset Investment.Growth slowed to the slowest pace since this data was first recorded back in 1992, printing in decline for a fifth consecutive month. Industrial Production. Missed expectations for a third consecutive month, while printing at a growth rate equaling the nation’s slowest since February of 2016. Retail Sales. Finally showing a dent in the armor, missed expectation while slowing from the prior month. Unemployment. This item has only been recorded since January. Headline unemployment “popped” up to 5.1% from June’s 4.8%. 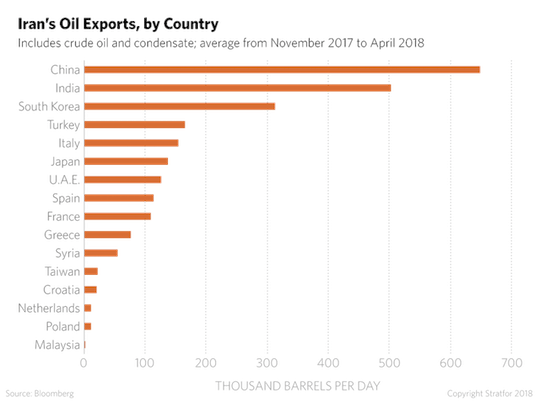 Oil Production. The NBS reported that Chinese oil production fell 2.6% in July, and now stands from a daily perspective at the lowest level since June of 2011. China will not report Q3 GDP until October 15. The National Bureau of Statistics reported annualized growth of 6.7% for the second quarter. Depending on the veracity of the data, one must start to wonder if China can indeed hang on to growth of 6.5% going forward." Cutting a nation off from SWIFT is like taking away its oxygen. 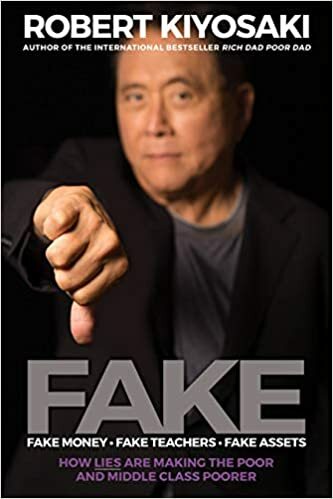 My longest piece on this topic was Chapter Four of my second book, The Death of Money(2014), but I’ve written much else besides, including many articles for my newsletters. 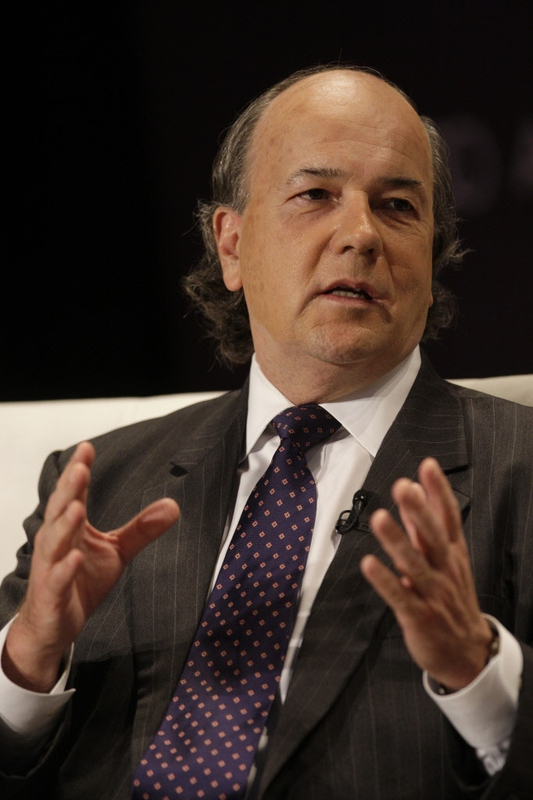 Jim Rickards: Gold Price on the Verge of a Breakout? In this four-part video series Jim Rickards, bestselling author and investment banker, discusses the core topics of this year´s "In Gold we Trust" report with the two authors Ronald-Peter Stöferle and Mark Valek. 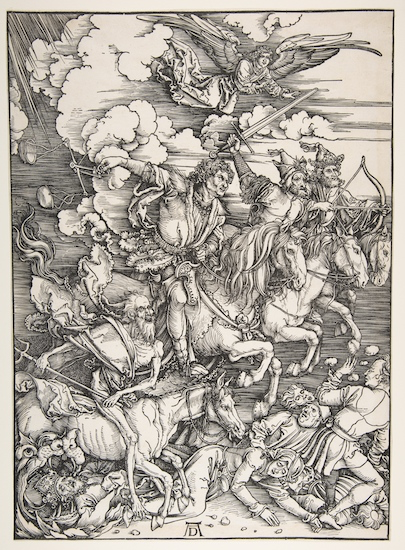 Investors have a tendency to dismiss these threats, either because they have persisted for a long time in many instances without catastrophic results, or because of a belief that somehow the crises will resolve themselves or be brought in for a soft landing by policymakers and politicians. These beliefs are good examples of well-known cognitive biases such as anchoring, confirmation bias and selective perception. Analysis tells us that there is little basis for complacency. Yet the VIX is back near all-time lows as shown in Chart 1 below. Even if the probability of any one event blowing up is low, when you have a long list of volatile events, the probability of at least one blowing up approaches 100%. With this litany of crises in mind, each ready to erupt into market turmoil, what are my predictive analytic models saying about the prospects for an increase in measures of market volatility in the months ahead? They’re saying that investor complacency is overdone and market volatility is set to return with a vengeance. Even with the Facebook blowup and trouble in the tech space, VIX is just above 13. Changes in VIX and other measures of market volatility do not occur in a smooth, linear way. The dynamic is much more likely to involve extreme spikes rather than gradual increases. 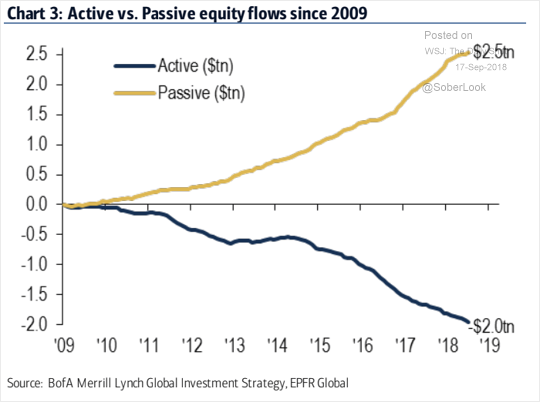 This tendency toward extreme spikes is the result of dynamic short-covering that feeds on itself in a recursive manner — or what is commonly known as a feedback loop. Shorting volatility indexes has been a very popular income-producing strategy for years. Traders sell put options on volatility indexes, collect the option premium as income, wait out the option expiration and profit at the option buyer’s expense. It’s been like selling flood protection in the desert; seems like easy money. The problem is that every now and then a flash flood does hit the desert. When we consider recent financial catastrophes affecting U.S. investors only, without regard to other types of disaster, we have had major stock market crashes or global liquidity crises in 1987, 1994, 1998, 2000 and 2008. Investors expect that the future will resemble the past, that markets move in continuous ways and that extreme events occur rarely, if at all. These assumptions are all false. The future often diverges sharply from the recent past. Markets gap up or down, giving investors no opportunity to trade at intermediate prices. Extreme events occur with much greater frequency than standard models expect. When they do strike seemingly from nowhere, like fire in a crowded theater, everybody panics and a wave of selling feeds upon itself. The trouble is, most investors will never make it out of the theater in time. 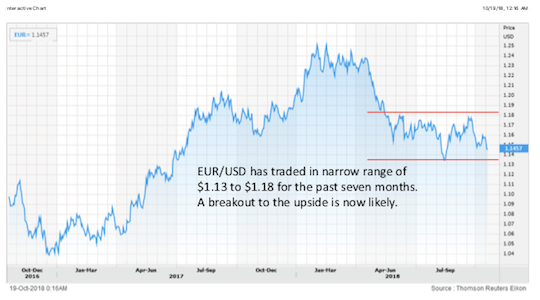 In January 2018, two significant market events occurred nearly simultaneously. Major U.S. stock market indexes peaked and volatility indexes extended one of their longest streaks of low volatility in history. Investors were happy, complacency ruled the day and all was right with the world. Then markets were turned upside down in a matter of days. Major stock market indexes fell over 11%, a technical correction, from Feb. 2–8, 2018, just five trading days. The CBOE Volatility Index, commonly known as the “VIX,” surged from 14.51 to 49.21 in an even shorter period from Feb. 2–6. The last time the VIX has been at those levels was late August 2015 in the aftermath of the Chinese shock devaluation of the yuan when U.S. stocks also fell 11% in two weeks. Investors were suddenly frightened and there was nowhere to hide from the storm. Analysts blamed a monthly employment report released by the Labor Department on Feb. 2 for the debacle. The report showed that wage gains were accelerating. This led investors to increase the odds that the Federal Reserve would raise rates in March and June (they did) to fend off inflation that might arise from the wage gains. The rising interest rates were said to be bad for stocks because of rising corporate interest expense and because fixed-income instruments compete with stocks for investor dollars. Wall Street loves a good story, and the “rising wages” story seemed to fit the facts and explain that downturn. Yet the story was mostly nonsense. Wages did rise somewhat, but the move was not extreme and should not have been unexpected. The Fed was already on track to raise interest rates several times in 2018 with or without that particular wage increase. Subsequent wage increases have been moderate. The employment report story was popular at the time, but it had very little explanatory power as to why stocks suddenly tanked and volatility surged. The fact is that stocks and volatility had both reached extreme levels and were already primed for sudden reversals. The specific catalyst almost doesn’t matter. What matters is the array of traders, all leaning over one side of the boat, suddenly running to the other side of the boat before the vessel capsizes. Markets are once again primed for this kind of spontaneous crowd reaction. Except now there are far more catalysts than a random wage report, despite last week’s optimistic GDP report. The U.S. has ended its nuclear deal with Iran and has implemented extreme sanctions designed to sink the Iranian economy and force regime change through a popular uprising. Iran has threatened to resume its nuclear weapons development program in response. Both Israel and the U.S. have warned that any resumption of Iran’s nuclear weapons program could lead to a military attack. Venezuela, lsed by the corrupt dictator Nicolás Maduro, has already collapsed economically and is now approaching the level of a failed state. Inflation exceeds 40,000% and the people have no food. Its inflation rate has now exceeded the hyperinflation of Weimar Germany. Social unrest, civil war or a revolution are all possible outcomes. If infrastructure and political dysfunction reach the point that oil exports cannot continue, the U.S. may have to intervene militarily on both humanitarian and economic grounds. North Korea and the U.S. have pursued on-again, off-again negotiations aimed at denuclearizing the Korean Peninsula. While there have been encouraging signs, the most likely outcome continues to be that North Korean leader Kim Jong Un is playing for time and dealing in bad faith. The U.S. may yet have to resort to military force there to negate an existential threat. This litany of flash points goes on to include Iranian-backed attacks on Saudi Arabia and Israel, a civil war in Syria, confrontation in the South China Sea and Russian intervention in eastern Ukraine. These traditional geopolitical fault lines are in addition to cyber threats, critical infrastructure collapses and natural disasters from Kilauea to the Congo. The problem from an investor’s perspective is they are “slow burn” crises and can linger for a long time before producing anything dramatic such as a shooting war or market collapse. They are not date-driven or date-specific in the short run. One story that’s under the radar and could blow up soon is Chinese currency devaluation. If Trump puts a 25% tariff on Chinese imports but China then devalues its currency 25%, then the net effect is zero. The impact of the devaluation offsets the impact of the tariff and then you’re back where you started. Once Trump focuses on this, he’s likely to be infuriated and retaliate against China in the currency war and take steps to penalize China for currency manipulation over and above the existing tariffs and penalties for theft of intellectual property. This has a hard date of Oct. 15, 2018. That’s the date of the U.S. Treasury’s semiannual report on Macroeconomic and Foreign Exchange Policies of Major Trading Partners of the United States. That report is the formal mechanism for labeling a trading partner such as China a “currency manipulator” with severe consequences. Oct. 15, 2018, is just three weeks before the midterm elections, so it could be a highly popular political move in addition to being economically important. All of this and more is on Trump’s policy plate right now. Just don’t expect him to handle it the way politicos usually do. Investors should expect dramatic policy shifts and extreme threats. But don’t overreact like the Washington pundits. Remember, it’s all the art of the deal. I’m continually amazed at the legions of politicos, pundits and so-called “experts” who don’t understand President Trump or how he conducts policy. These elites have a mental model of how a president is supposed to behave and how the policymaking process is supposed to be carried out. Obviously, Trump does not fit their model. Really, these people need to get out of Washington, New York and Hollywood more and get away from their screens. If they knew more everyday Americans, they would come a lot closer to understanding how Trump gets things done. It’s not chaos; it’s just a little different and more down to earth. This is because of Trump’s “art of the deal” style described in his best-selling book by that name. Bush 43 and Obama were totally process-driven. You could see events coming a mile away as they wound their way through the West Wing and Capitol Hill deliberative processes. All you had to do was understand the process and you could forecast big developments in a relatively straightforward way. With Trump, there is a process, but it does not adhere to a timeline or existing template. Trump seems to be the only process participant most of the time. If the opponent fires back, double down. If Trump declares tariffs on $50 billion of good from China,and China shoots back with tariffs on $50 billion of goods from the U.S., Trump doubles down with tariffs on $100 billion of goods, etc. Trump will keep escalating until he wins. No one else in Washington thinks this way. Washington insiders try to avoid confrontation, avoid escalation, compromise from the beginning and finesse their way through any policy process. 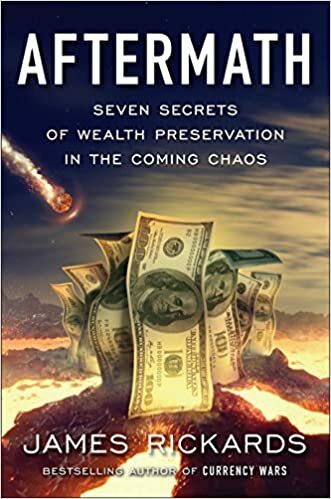 "When we consider recent financial catastrophes affecting U.S. investors only, without regard to other types of disaster, we have had major stock market crashes or global liquidity crises in 1987, 1994, 1998, 2000 and 2008. 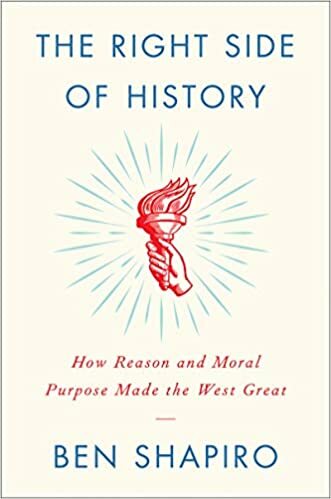 But it does mean that we need to overcome any cognitive bias about the future being like the past or about recent calm being a good forecast for the future (called “recency bias” by behavioral psychologists). When the 100-year flood does hit, it’s too late to buy flood insurance. Likewise, when the next financial crisis hits, it will be too late to buy gold at today’s relatively attractive prices. The best time to buy flood insurance is when the sun is shining." One of the long-standing reasons to own physical gold or invest in gold mining shares is to hedge geopolitical risk or the risk of natural disaster. From the Black Death in the 14th century to the Thirty Years’ War in the 17th century to the world wars of the 20th century, gold has been a reliable store of wealth. There is no reason to believe that such existential events are no longer a danger. I don’t think you need any reminder of the litany of risks present today. The United States is determined to prevent Iran from obtaining nuclear weapons. Iran is equally determined to develop them. Iran’s neighbors, such as Saudi Arabia, have said that if Iran obtains nuclear weapons, they will quickly do the same. North Korea already has an arsenal of nuclear warheads with a yield approximately the size of the Hiroshima atomic bomb, about 15 kilotons of TNT, but it has tested much larger weapons. It has also developed intermediate-range ballistic missiles (IRBMs) and has tested intercontinental ballistic missiles (ICBMs). Denuclearization discussions are ongoing between the U.S. and North Korea, but President Trump has made it clear that he will attack North Korea if it advances further toward its stated goal of having a deliverable nuclear weapon that can reach the U.S. If talks fail and the U.S. does attack North Korea, it is likely that North Korea will unleash devastating force on South Korea and possibly launch a nuclear weapon aimed at Japan. That’s just scratching the surface. Natural disasters abound from the extreme flooding of Hurricane Harvey to the lava flows of Kilauea on Hawaii. The Ebola virus has reemerged in the Congo, four years after a prior epidemic in West Africa caused 10,000 deaths. Other threats are ubiquitous. New threats are also emerging that are not traditionally geopolitical or natural. These include power grid collapses, cyberwarfare, hacking, data theft and misuse of big data including examples such as Russian interference in recent U.S. elections. Killer robots, swarm attack drones and rogue artificial intelligence applications are coming soon. An investor would not be blamed for saying, “So what?” Many of the threats mentioned have been festering for years. Going back further in time would produce a different list of threats, most of which never came to fruition. Americans, in particular, seem safe from the worst of these threats except for the temporary effects of a bad storm or wildfire in a specific area. To most Americans, these threats are just background noise. Complacency rules the day. But here’s an interesting bit of math, somewhat simplified, that might break investors out of their complacency. Don’t worry about the details, but I strongly urge you to focus the implications. This will not involve dead-end cryptocurrencies like bitcoin but entirely new utility tokens and cryptos. Imagine something like a putincoin and you’ll be on the right track. China is pushing its trade counterparties to accept Chinese yuan as payment for goods and services. The yuan is a small part of global payments today (about 2%) but the yuan may get a boost as the U.S. sanctions on Iran kick in. China is Iran’s biggest customer for oil, and if U.S. sanctions prohibit dollar payments for Iranian oil, then Iran and China may have no choice but to transact in yuan. Alongside the new money in cryptocurrencies, there is the oldest form of money, which is gold. The use of gold is the ideal way to avoid U.S. financial warfare. Gold is physical so it cannot be hacked. It is completely fungible (an element, atomic number 79) so it cannot be traced. Gold can be transported in sealed containers on airplanes so movements cannot be identified through wire transfer message traffic or satellite surveillance. There is good evidence that Iran currently pays for North Korean weapons technology with gold, and good reason to expect that future Chinese payments for Iranian oil will be made at least partly in gold. Imagine a three-way trade in which North Korea sells weapons to Iran, Iran sells oil to China and China sells food to North Korea. All of these transactions can be recorded on a blockchain and netted out on a quarterly basis with the net settlement payment made in gold shipped to the party with the net balance due. That’s a glimpse of what a future nondollar payments system looks like. Finally, look at the evidence presented in Chart 1 below. This shows Russia’s reserve position from 2013–18. The reserve position collapsed from $540 billion to $350 billion as a result of the oil price crash beginning in late 2014. (And query whether the oil price collapse itself was engineered by the U.S. in retaliation for Russia’s annexation of Crimea). Since early 2015, Russia has rebuilt its reserve position under the patient stewardship of Russian Central Bank head Elvira Nabiullina. 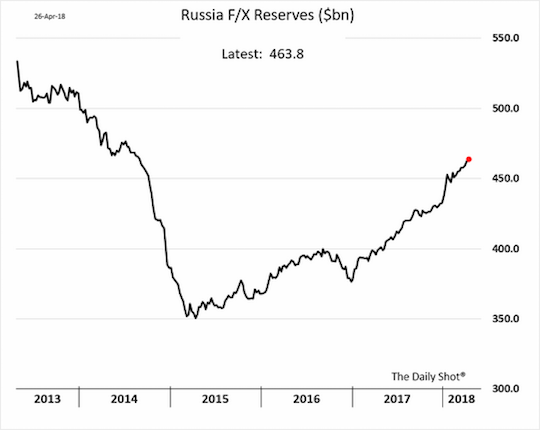 Russian reserves are now back up to $460 billion and rising steadily. Yet there’s one huge difference between Russian reserves in 2014 and those reserves today. That difference is gold. During the reserve collapse in 2014, Russia sold U.S. dollar assets as needed to maintain liquidity, but it never stopped buying gold. Russian gold reserves rose from 1,275 tons in mid-2015 (near the reserve low) to 1,909 tons at the end of April 2018. That’s a 50% increase in gold reserves in less than three years. Using current market prices, the Russia gold hoard is worth about $90 billion, or 20% of Russia’s global reserve position. The bottom line is that the weaponized dollar will soon be a victim of its own success. While the U.S. was bullying the world with dollars, the world was quietly preparing a new nondollar system. The U.S. wanted diplomatic and military clout and it got it with the dollar. Wise investors will prepare now for a new nondollar payments system. You may not be able to buy crypto SDRs (yet), but you can certainly own gold, and you should. Before turning to specific tactics, consider the following. The dollar constitutes about 60% of global reserves, 80% of global payments and almost 100% of global oil transactions. European banks that make dollar-denominated loans to customers have to borrow dollars to fund those liabilities. Those banks do their borrowing in the eurodollar deposit market, or with dollar-denominated commercial paper or notes. Being based in Switzerland or Germany does not allow you to escape from the dollar’s dominance. The U.S. not only controls the dollar itself. It controls the dollar payments system. This consists of the Treasury’s digital ledger of holders of U.S. debt, the Fedwire payments system among U.S. Fed member banks and the Clearing House Association (successor to the New York Clearing House and proprietor of CHIPS, the Clearing House Interbank Payments System) composed of the largest U.S. banks. A dollar payment going from a bank in Shanghai to another bank in Sydney runs through one of these U.S.-controlled payments systems. In short, the dollar is the oxygen supply for world commerce and the U.S. can cut off your oxygen whenever it wants. The list of ways in which the dollar can be weaponized is extensive. The International Emergency Economic Powers Act of 1977, IEEPA, gives the president of the United States dictatorial power to freeze and seize assets and block payments. 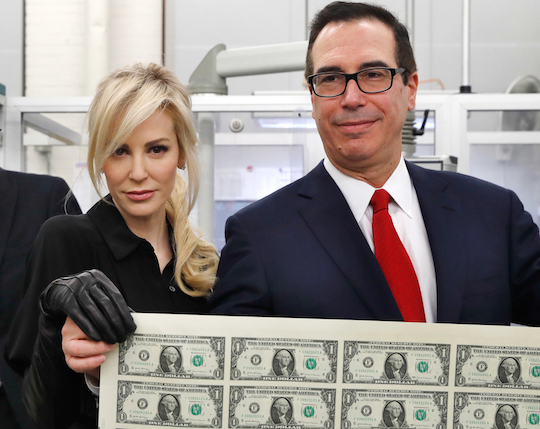 The Treasury’s Office of Foreign Assets Control, OFAC, maintains a blacklist of individuals and companies with whom financial intermediaries, such as banks and credit card companies, are forbidden to transact. Individuals on the OFAC list are like dead men walking when it comes to travel and business. The Committee on Foreign Investment in the United States, CFIUS, can block any foreign acquisition of a U.S. company on national security grounds. This list of financial weapons goes on, but you get the idea. The U.S. uses the dollar to force its enemies into fronts, crude barter or the black market if they want to do business. Examples of the U.S. employing these financial weapons are ubiquitous. The U.S. slapped sanctions on Russia after the 2014 annexation of Crimea and invasion of Eastern Ukraine. The U.S. waged a full-scale financial war with Iran from 2011–13 that resulted in bank runs, hyperinflation, local currency devaluation and social unrest. The U.S. was pushing Iran to the brink of regime change in 2013 when President Obama declared a truce to pursue what became the Joint Comprehensive Plan of Action, JCPOA, or the Iran nuclear deal. President Trump has now ended that deal and the financial war with Iran has resumed where it left off in 2013, but tougher than ever. The U.S. is slapping stiff Section 301 penalties on China for theft of intellectual property. Other obvious victims of U.S. financial weapons are North Korea, Syria, Cuba and Venezuela. The actions described above did not arise in the normal course of trade and finance. The Russian, Iranian and other sanctions noted are explicitly geopolitical, while the Chinese sanctions are geostrategic to the extent the U.S. and China are vying for technological supremacy in the 21st century. None of these sanctions would be effective or even possible without the use of the dollar and the dollar payments system. Yet for every action there is a reaction. America’s adversaries realize how vulnerable they are to dollar-based sanctions. In the short run, they have to grin and bear it. They’re fully invested in the dollar both in their reserves and in the desire of their largest companies like Gazprom (Russia) and Huawei (China) to become major global players. Transacting on the world stage means transacting in dollars. And dollar-based sanctions are a powerful financial weapon for the U.S. But our adversaries and so-called allies are not standing still. They are already envisioning a world where the dollar is not the major reserve and trade currency. In the longer run, Russia, China, Iran, Turkey and others are working flat-out to invent and implement nondollar transactional currencies and independent payments systems. The problem is that regulators are like generals fighting the last war. In 2008, the global financial crisis started in the U.S. mortgage market and spread quickly to the over-leveraged banking sector.